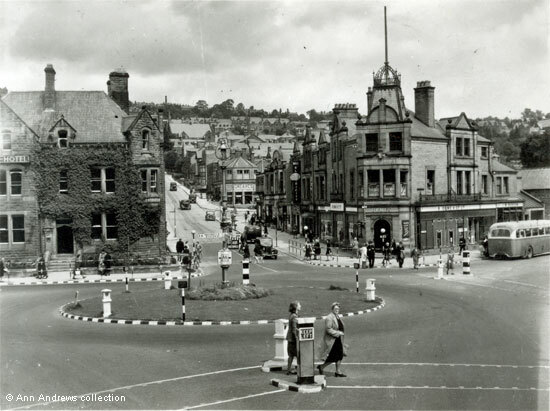 Crown Square in the late 1940s and early 1950s had changed only slightly from the Crown Square of the late 1930s. 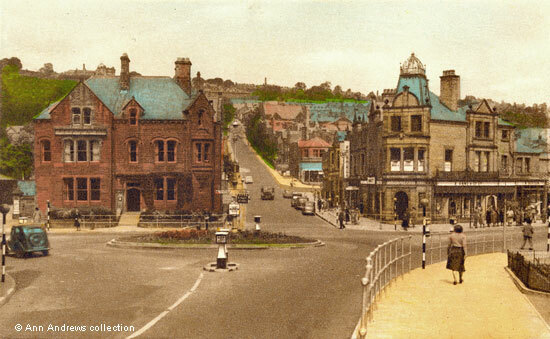 Some safety measures had been introduced to aid motorists (see both the top postcard and the photograph below), as black and white paint on the kerbstones and the railings all round the Square highlighted the potential hazards. This was undoubtedly left over from the blackout imposed during World War Two when kerbs were painted and white lines appeared down the centre of the roads. Signposts were taken down and even milestones were removed or obscured as defence measures to cause confusion in the event of an invasion. Street lighting had been either turned off or the lamps were covered. There are two things that help determine the date of all three pictures on this page. The first is the lamp in the middle of the traffic island. In 1950 the Matlock Road Safety Committee decided to recommend the introduction of fluorescent lighting. This had been suggested by Mr. J. Shaw, a representative of the bus drivers. So the tall lamp standard's days were numbered. The second is the bus stop seen next to the railings outside Orme's Causeway Lane shop front. A brand new bus station on Bakewell Road opened in 1952 and the bus stop here was not used afterwards. The railings, particularly those on the Orme's corner, provided a place where people would pause for a chat, often resting their arms on the top rail. 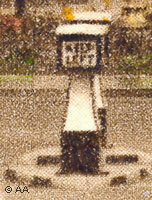 Crown Square was unfortunately flooded in September 1946, when Derbyshire rivers burst their banks. Goods had to be removed from the cellars of business premises in both Crown Square and Bakewell Road. Most of the shops and businesses were the same as those trading in the pre war era. 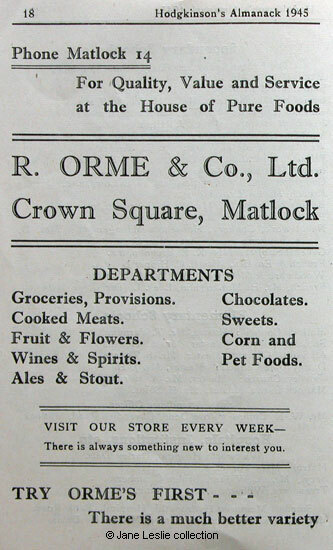 Next door to Orme's, on Causeway Lane, was a well established butchery run by John William Boden. On the Bank Road side of Orme's was Rock Cafe, although this was sold for £14,000 in 1947. The sale notices described the premises as a double-fronted sale shop, with rooms at the rear, a first floor cafe, club rooms, etc. The other shops hadn't changed: The Derbyshire & Nottinghamshire Electric Power Company showrooms sported a long white banner which says "ELECTRICITY", next door were the Sheffield Gas Company's showrooms, then Arthur William Gessey's stationers, Evan's cafe and confectioners and J. H. Dewhurst's butchers. The shop on the corner of Bank Road and Lime Grove Walk (green signs on the top image and blue on the bottom one) had become the furniture store of T. Greaves and Co. Ltd. before the war. and this photograph was possibly taken not long after the war ended. There were no curtains at the hotel's windows and it looks uninhabited. The second and third images show the Orme's bus stop in use. In the second image passengers were either getting on or getting off a bus whereas in the third picture a queue had formed at the stop. People were waiting to board one of the buses that went up to the Duke of Wellington, via Matlock Green, from Cromford and Matlock Bath. The bus stop for those who wished to go to Cromford, using the reverse Duke/Matlock Green route, would board the bus on the opposite side of Causeway Lane. The photograph for this third picture was taken slightly later than those for the other two images. There were new bollards in the centre of the road on the pedestrian crossings (close up on the left). Most of the black and white paintwork had disappeared, but still remained below the bollards, although the black and white below the bollards had been introduced pre war. Zebra crossings had not yet been introduced into Crown Square. It is hard to work out what happened to the greenery (virginia creeper?) on the front of the Crown Hotel which was so luxuriant in the other two pictures. It now only covered the wall below the first floor, so had either been severely cut back or was not yet out. It is more likely to be the former as it looks clipped. The sign for the hotel, above the first floor window on the left, was missing. It had presumably been taken down for re-painting. 1. 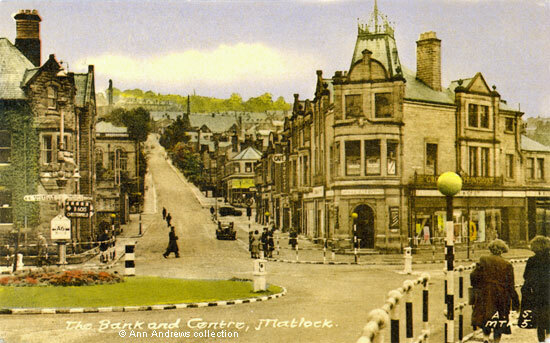 "The Bank and Centre, Matlock". F. Frith & Co. Ltd., Reigate. A.F.S. MTK. 5. Frith's Series. Not posted. 2. Photograph of Crown Square. No date. 3. "Matlock, Crown Square". Photochrom Co Ltd., Graphic Studios, Tunbridge Wells, Kent, No V4269. Not posted. 4. Advertisement for Marchant Brooks from "Hodgkinson's Matlock and Historic Almanack, 1945 (War Edition)" © Jane Leslie collection. Postcards and photograph in the collection of and provided by and © Ann Andrews. There is more about blacked out Britain on: New restrictions on the home front - Britain is blacked out! (an external link, so might appear in a new tab or window). "Derby Daily Telegraph", 2 December 1950. "Derby Daily Telegraph", 5 May 1948. The "Rock Cafe" ,Crown-square and Causeway-lane. Matlock, offered with vacant possession, was sold the previous day. "Derby Daily Telegraph", 21 September 1946. Matlock Bath was also affected and businesses on The Parade also had to clear their cellars.